Famed animator Genndy Tartakovsky (Dexter’s Laboratory, Samurai Jack, Star Wars: Clone Wars) recently graduated to the big screen with the animated feature Hotel Transylvania, currently in theaters. Featuring the voice talents of Adam Sandler and his usual crew (Kevin James, David Spade, Andy Samberg), Transylvania tells the story of Dracula (Sandler), an overprotective single parent, who has raised his vampire daughter Mavis in isolation far from the evil eyes of humans. A Dave Matthews Band-loving modern hippie crashes Mavis’ 118th birthday party and Dracula is eventually forced to face his fears both as a parent and an outsider. It’s fun stuff though not without its cringe-worthy, kid-oriented moments (that final Auto-Tune-heavy musical number was rough). 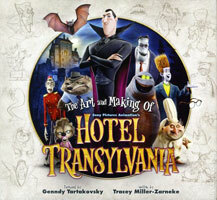 The film’s accompanying 160 page art book, The Art and Making of Hotel Transylvania (Titan Books), is pretty much the lavish exploration into the film’s conceptual background that you’d expect. Following introductions by Tartakovsky and Sony Pictures Digital Productions President Bob Osher, author Tracey Miller-Zarneke (author of five additional books on the subject of animation) divides the book into two halves: character design and production design. A generous amount of sketches, artwork, and stills accompany each character bio, some of which are drawn by Tartakovsky himself. Accompanying text ranges from short bios to interviews with the creators regarding the creative decision making process. Elaborately detailed Easter eggs are featured throughout including closeups of the patches that cover the hippie’s backpack and the humorous stamps on delivery boxes. There are even conceptual sketches of little-seen or completely unseen characters…all of it adds up to a really nice-looking coffee table book that has found a new home in my living room for Halloween seasons to come.